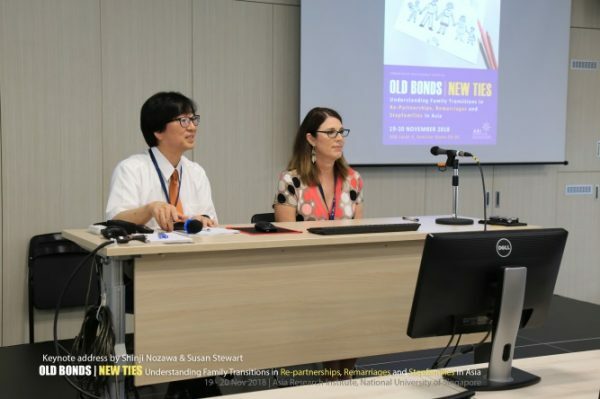 On November 19 and November 20, 2018, Susan Stewart, professor of sociology, traveled to Singapore to present as one of two keynote speakers at Old Bonds, New Ties: Understanding Family Transitions in Re-partnerships, Remarriages and Stepfamilies in Asia. The two-day conference addressed family transitions, including remarriage, re-partnering and stepfamilies within the cultural context of Asia. Topics covered included: adult and children well-being outcomes, socio-cultural attitudes, social support, the role of public laws and policies, impact of demographic changes and the transitions in family processes. Stewart’s presentation, “Social and Policy Implications of Stepfamilies: Lessons from the United States,” was an informational talk aimed at using Western concepts to inform the recent cultural shift in Asia. The policies in the United States are complicated, as Stewart’s research shows. “My research shows that in the U.S., stepfamily life is regulated by a complex mix of federal laws, state laws and court cases, not unlike a ‘patchwork quilt.’ Our official policies on families continue to privilege legal marriage, biological relationships, and traditional family forms and disadvantages the half of all Americans that live in alternative family structures. Stepfamily living is a reality of modern society and understanding cultural differences in stepfamily formation and dynamics, both in the U.S. and abroad, is important as our world continues to diversify,” Stewart explained. Stewart’s research as presented at the conference is forthcoming as a special issue in a family journal.